My paint is peeling. My nails are rust. 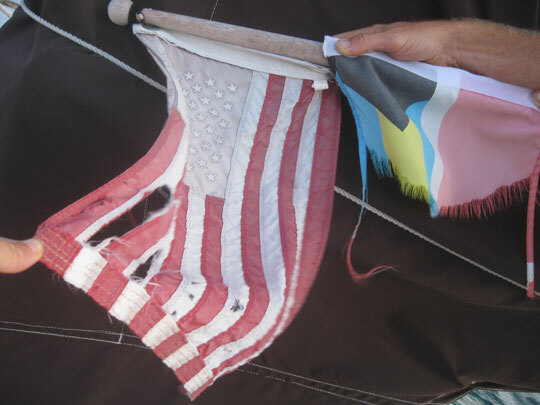 Our flags look more like rags. These are a couple of lines from a nice old John Langford song. Itâ€™s a fun listen if you havenâ€™t heard it yet. After four months of sailing Duwan and I are doing well, but Blue Wing has a lot of breakage. Poor girl is more broke than the Ten Commandments. Replacement parts are expensive here, so we have mostly applied temporary patches. We have a long list of permanent fixes to make when we get back to the States. In fact, we should probably go ahead and start working our way back now. First, we exhausted the battery bank by keeping the fridge too cold. Weâ€™ve been buying ice for a few months now, and the batteries are nursed back to good health. When the sun shines and the wind blows we can keep them recharged. But they still suffer on cloudy, still days. Our inflatable dinghy is fully collapsible. Most of the other inflatables we have seen sport hard fiberglass bottoms. Our dinghy bottom is flexible plastic with slats in it for support. The bottom is separating from the inflatable part and no glue or epoxy Iâ€™ve tried seems to work well. Itâ€™s jury rigged now to leak more slowly, but we really need a new dink. One of our deck cleats is broken. A teeny plastic tab broke off. Fortunately, the cleat still secures the halyard which holds the mainsail up. Unfortunately I need to punch it with a big wrench to get the mainsail to come down. 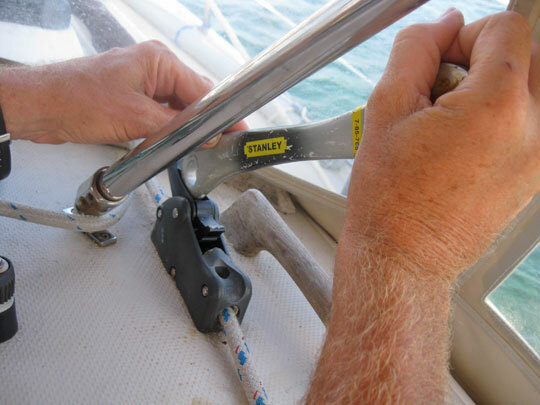 Wrench applied to halyard cleat. Our winch, which froze while Debbie and Karen were here, needs replacing. This is an original winch which wasnâ€™t even used for the full model year our boat was built. It took Duwan hours to find a document on the web describing how to remove the top. 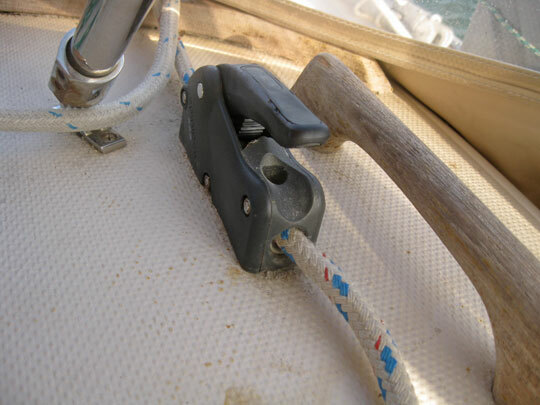 Current winches have screws or cinclips. For this winch a mallet and piece of wood are used to hammer the top off. 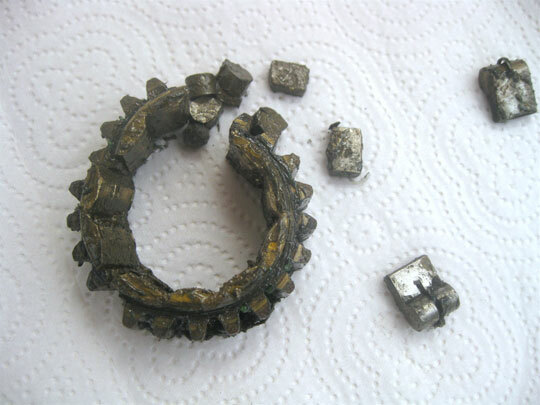 I took it apart to find that the primary gear was broken in pieces. So, for now, I have lines running to unusual places toward the stern of the boat. After Debbie and Karen left I installed a replacemet Glo Plug switch. I didnâ€™t have the heat sealing electrical connections needed for the marine environment, so I just taped the wires together with electric tape. We had more water problems after Debbie and Karen left. The water pump quit working. We bought and installed a replacement pump, which works well. 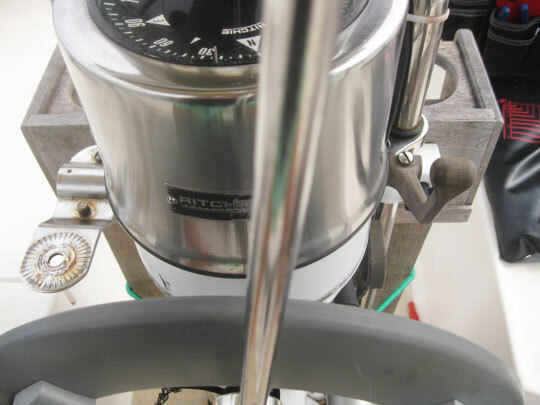 This pump produces more pressure, so other water connections in the system kept blowing out. I think I have tamed all these, but one needs a more permanent fix than the soft rubber hose and Teflon tape currently holding it together. 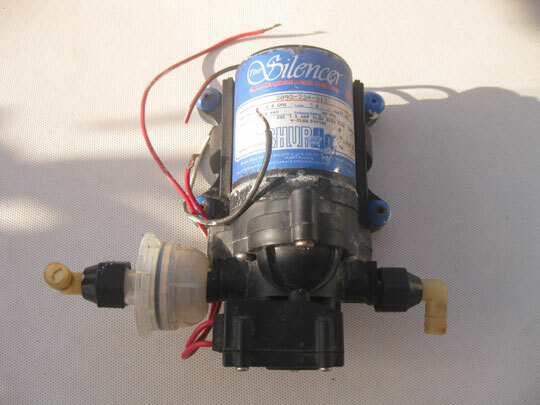 When we bought the water pump I was able to get heat seal connections for the Glo Plug switch, so itâ€™s good to go now. When we last left Marsh Harbor Duwan was surprised to find the plastic gear shift knob come apart in her hand. Presently, an old grill bracket works as her shift lever. On the right good shift lever. On the left makeshift lever. The list itself isnâ€™t troublesome. I have really come to enjoy working on the old gal. My past few homes have been old and have required a lot of attention. I like working on them (when itâ€™s not an emergency). This is a little different, though. I know a boat, like a house, is an inanimate object. But Blue Wing and I have traveled together. Weâ€™ve bumped into things, run aground, gotten soaked and blown around. I need to get her back into shape so we can go back out again. And I need to start lobbying Duwan to have our next refit done in the Dominican Republic! Greg and Duwan, such wonderful spirit.. all kinds of corny phrases come to mind to keep you moving toward the Dominican… continue to have great adventures.